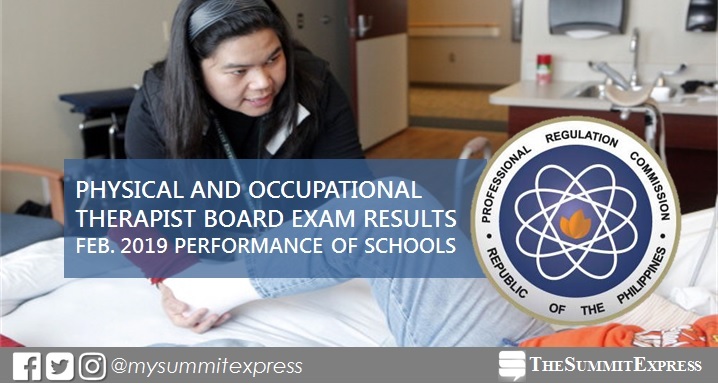 MANILA, Philippines – The Professional Regulation Commission (PRC) hailed the top performing schools in the February 2019 Physical Therapist (PT) and Occupational Therapist (OT) board exam. The results are released today, February 7, 2019 or in two (2) working days after the exam. PRC conducted the licensure exam in Manila and Cebu on February 3 and 4, 2019. In the February 2018 exams, San Pedro College (SPC) - Davao City was the lone top performing school in the Physical Therapist board exam with 96.08 % or 49 out of 51 passed. Cebu Doctors University (CDU) led the schools in the Occupational Therapist board exam with 100% passing rate or 13 takers hurdled the test. In the February 2017 exams, Angeles University Foundation (AUF) and University of the Philippines (UP) - Manila tied on highest place for PT exams, both having 100% passing rate. UP-Manila was also hailed top school in the OT exams, with all of its takers passed. Monitor this page for the real-time updates on PT-OT results. Check out also the official website of PRC for more information. Don't miss our regular updates and awesome stories. Like us on Facebook, follow us on Twitter, subscribe via E-mail or check out our Instagram feed. © 2012-2019 The Summit Express. All Rights Reserved.